Kyocera TASKalfa 3011i / 3511i: Kyocera’s TASKalfa 3011i and 3511i power companies and workgroups of all sizes. 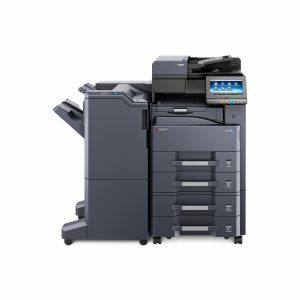 Crisp black and white output combined with advanced finishing and plenty of speed will help keep your business operating at its peak level. There are many options and feature available on these products to include stapling and punch, standard AirPrint, Google Cloud Print, WiFi and on device WiFi Hotspot for all of your mobile integration needs. The document imaging portal drives more than copy, print, and scan, it also simplifies your most frequent tasks such as knowledge sharing, archiving and more with the addition of powerful yet scaleable KYOCERA Business Applications.